Zelena continues watching through a portal in the palace of the Emerald City. She watches me struggle to learn magic. This causes her to scoff as magic comes so naturally with her. Glinda interrupts Zelena and tells her thank you for getting rid of the charlatan of a wizard. She tells Zelena she is wasting her talents on foolish pursuits and should come with her. Glinda introduces Zelena to the witches that she calls her sisters. Each sister represents a corner and they have one seat left to represent the west. Zelena asks about traveling back in time. Glinda tells her they want to shape her future and not the past. The west represents innocence and Zelena does not believe that she is meant for this as she is wicked. The witches tell her that Glinda possesses a book of prophecies and that they have been waiting for a witch brought by a cyclone. Glinda tells Zelena she does not have to be wicked and can shape her own future if she will give up the past. Zelena returns to the palace and again watches the portal. She says aloud that she is over me. Glinda tells her she made the right choice. She gives her a white pendant and tells her that this pendant will make her even more powerful. She also warns to guard the pendant with her life as without it she will be powerless. She shows Zelena to a mirror. Zelena’s skin color has returned to normal. Glinda takes Zelena to the west. The land becomes dark. A cyclone drops a house. A teenage girl comes out of the house and tells them she is Dorothy Gale from Kansas. Zelena is immediately jealous of the attention Glinda gives Dorothy. The witches welcome Dorothy. They feed her. Glinda notices Zelena is outside watching them. She goes outside to Zelena. Zelena’s skin is turning green again. Zelena has Glinda’s book of prophecies. According to the book, white magic will come along and take the seat of evil. She believes this means that Dorothy will take her seat. Glinda once again reminds her that she is only choosing to be evil. Dorothy goes to the well to get water. She is frightened by Zelena who is now fully green again. Zelena means to destroy Dorothy with a ball of fire. Dorothy throws water at her and then apologizes. Zelena melts telling Dorothy that she has destroyed her. Glinda finds a frantic Dorothy who tells her what has happened. Glinda simply tells her it was destiny and that Dorothy is meant to take Zelena’s seat as the witch of the west. Dorothy tells Glinda she wishes to go home. Glinda agrees to take Dorothy to see the wizard believing he will be back and Zelena’s magic has been overturned. Once they are out of sight Zelena materializes. At the palace Dorothy asks the wizard to send her home. He grants her golden slippers and tells her to click her heels and think of home. Dorothy leaves to return to Kansas. Zelena then separates the curtain and reveals herself to Glinda. Glinda warns Zelena if she stays wicked she will always search for someone to defeat her. Zelena banishes Glinda to the Dark Forest. Once Glinda is gone Zelena’s pendant turns from white to green. Rumpel continues spinning straw into gold. Zelena transforms a lump of golden straw into a brain. She places it in a box. She then takes Rumpel to the site she wishes to enact her time travel ritual. She forces Rumpel to dig. He tells her even if the spell works the problem is she will still be herself. The digging has created a symbol. Mary is in labor and has arrived at the hospital. I work with Emma to put protection spells in place advising her this may still not be a guarantee. Hook arrives at the hospital. Emma is still mad at him. He wants to help and she denies him. David hears them and advises Emma to take the help. He believes Hook lied because he was backed into a corner. As Emma and Hook are about to leave Henry and Leroy arrive. Henry tells Emma he is not worried. I promise Emma that Henry will be safe. Henry sits with Archie Hopper in the lobby. Unaware that Emma wants to go back to New York, Henry looks at classified ads for apartments. Archie suggests that Henry talk to Emma. Hook and Emma walk through the forest. He questions why she is so eager to run away from Storybrooke. Zelena and Rumpel interrupt them. Zelena uses Rumpel to throw Hook into water. Hook is unable to get out and Emma cannot help him. Zelena and Rumpel disappear. She gets Hook out and he is unconscious. Emma gives him mouth to mouth resuscitation which causes her to lose her magic. When Hook comes through he realizes what she has done. Robin and the Merry Men cannot hold off Zelena and Rumpel. She makes her way through the hospital halls using magic to freeze anyone in place or knock out anyone who gets in her way. Belle tries to stop them and Rumpel begs her to leave them. Zelena renders her unconscious and orders Rumpel to leave her. When she finds me she easily knocks me out as well. Zelena and Rumpel find Mary and David with their newborn son. She interrupts their happy moment by freezing them in place and taking the infant. Once they are gone David is able to move. He wants to go after them. 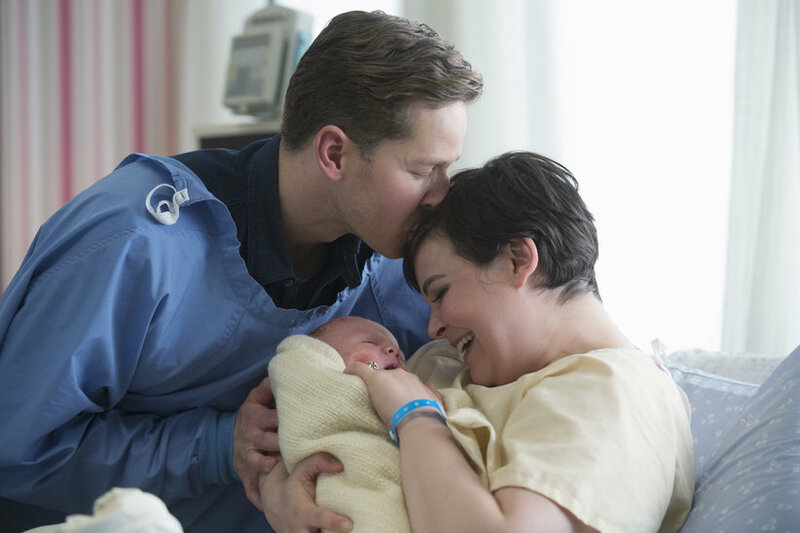 He tells Emma and Hook that the baby has been taken. Emma admits she lost her magic. Henry tells me that I can beat Zelena. I explain to him she can only be defeated by light magic. He tells me that I have changed and am now a hero. Robin agrees with him and tells me he also believes I can do this. Zelena places the baby in a basket as Rumpel looks on. He tells her no matter what happens he will kill her. With all of her ingredients in place she begins her time travel spell. This is interrupted when we all arrive to stop her. Zelena knocks people out and uses Rumpel and a flying monkey to help her. Rumpel tells Emma to find his dagger so she can get him on our side. Zelena suspends me in air with magic. Robin shows me he took my heart. I reach inside myself and create light magic. Zelena is shocked. Once free I go to her and take her pendant. The spell stops. The flying monkey turns into Little John. Rumpel wants to kill Zelena but I stop him. I possess his dagger and tell him heroes do not kill. He reminds me that she killed his son. I remind him of how many times that we killed to get what we wanted and this has to end. Zelena is in a jail cell. I sit outside her cell and tell her I understand her. I also tell her that my life has not been as grand as she thought it was. I tell a bitter Zelena that I want to give her a second chance and threaten her to stay in line. I leave and lock her pendant in my vault. Rumpel waits for Belle at his shop. She tells him that she knows everything that happened was because of Zelena and she will always love him. She tells him that I gave the dagger back and Belle wants to give it to him so he may be free but he must agree not to pursue Zelena. Rumpel tells her that she has his heart and he wants her to have the dagger. He then asks her to marry him. Belle gleefully accepts his proposal. David returns to Mary with their son. Hook asks Emma if she has her magic back. She tells him she does not. She tells him she will not need it in New York. Hook looks disappointed. He watches Emma join her family. Rumpel goes to visit Zelena in jail. He tells her that he has his dagger and the one Belle has is not the real one. He goes into her cell. Zelena pleads for her life reminding him she is powerless now. He stabs her. She turns to ceramic and shatters. He leaves the cell satisfied not knowing he has activated something else. Zelena’s ruins disappear. The magic from her pendant is released and travels to the site of the time travel ritual. A portal has opened.